The briefings for incoming Housing Minister Phil Twyford show a 45,000 home gap in Auckland.. Twyford maintains the previous Government intentionally kept the number secret. Officials over two of the briefings on housing do not mince words, blaming high house prices for widening inequality. 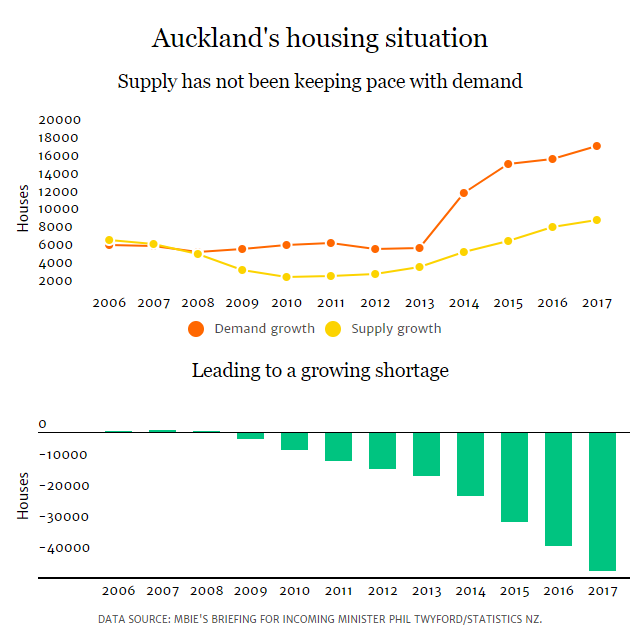 “High levels of immigration and fewer departing New Zealanders, along with natural population growth has seen demand for housing outstrip supply,” they write, pinpointing the start of this trend to 2003. 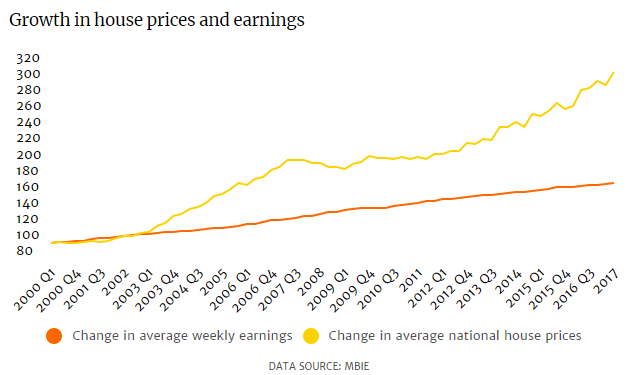 Both rents and house prices have risen far faster than incomes. “High house prices have stark distributional impacts: they transfer wealth from younger and less wealthy people to existing landowners, who are generally richer and older. The substantial increase in house prices over past decades appears to be the major cause of the observed increase in wealth inequality in developed economies, and the ongoing effect is one of restricting access to opportunity for the young and less well off. Officials note that high house prices also cause a significant drag on productivity and increase government costs. He said he did not think it was an “anomaly”. He said he was shocked to see there was a housing shortfall across New Zealand of 71,000. It’s going to take every ounce of effort by Labour to turn this mess around. As an aside, check-out this excellent documentary on the NZ housing crisis. As always … thank you Leith for an outstanding effort. The new Labour – led government will need to hit the ground running early in the New Year … focused on the abolition of urban limits and the introduction of bond financing for infrastructure . The 2018 14th Annual Demographia International Housing Affordability Survey is to be released Monday 22 January 2018. UE, you will never get a Game of Mates gig if you criticise the great and good like this. The current mess is due to profound policy errors by both strident conservatives and cowed progressives. Just gloss it over and the opportunities will seek you out. You have nothing to lose but your septum. But when will we get similar sensible politics here? I mean this kind of radical thinking makes me want to move to NZ. Gavin … remember this SHH article from early November ? When Australians are asked what worries them most, things such as healthcare, the cost of living, unemployment and crime are always near the top of the list. I have seen others as well echoing this. It is extremely heartening to me. We need to see Australia competing with New Zealand in supplying increasingly affordable housing ! Natasha King, Matt van der Haast and their two children, Jamie, 5, and Emily, 2, first featured on Stuff a year ago, when they were living with King’s father in order to save money for their first home. The couple was the first to sign up for a house in the new Belmont subdivision in Pukekohe under the Special Housing Areas legislation, which meant the completed “affordable” houses in the subdivision could not be sold for more than 75 per cent of the median house price in the Auckland region, which was $578,250. The private rental market is forcing low-income Kiwis to move too often, the human rights watchdog has told the new Government. In their briefing to incoming Justice Minister Andrew Little the Human Rights Commission (HRC) point to housing as a serious human rights issue that is likely stopping New Zealand meet its international obligations to uphold human rights. OPINION: It’s taken this long, but the shell shock of finding itself in Government seems to be wearing off for Labour. After an untidy start, the fightback has begun.